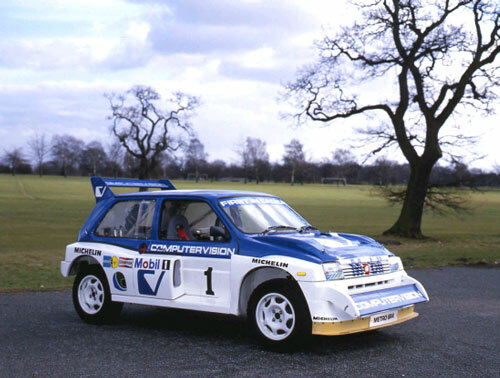 The MG Metro 6R4 (6 cylinder R rear engine 4 wheel drive) was a pure out and out competition car that retained a couple of panels from the original Metro body, but enough to clearly identify it as a Metro. It was built with the active assistance of Williams GP Engineering who at the time the project was started (1981) were at the pinnacle of F1 success and interestingly Austin Rover was a sponsor of Williams at this time. The car was built just for the purpose of achieving international rally success for Austin Rover and based upon a space frame chassis. Suspension was then attached direct to this chassis with suitable space being present for the rear mounted engine and four wheel drive system. The car was built to the famous Group B international rally specifications and this group included such well known competitors from other manufacturers such as the Audi Quattro Sport, Peugeot 205 T16, Lancia Delta S4 and Ford RS200. Notably the big difference with the Metro compared to all others in this group was the fact that it was the only one using a larger capacity naturally aspirated engine, where all the others were using smaller capacity forced induction engines. It has to be remembered that at this time turbo charging had become the fashionable way to creating performance versions of mainstream cars as it was cheaper to add a turbo to an existing engine than to develop a larger capacity new one. Even so turbo charging on cars was relatively crude and one common shortcoming was a condition known as turbo lag, the time between operating the throttle and when the engine saw boost and accelerated hard. The larger capacity non turbo engine would provide instant throttle response by comparison and so the theory was that it would more than offset the loss of top end power over the boosted rivals. Whilst that theory was no doubt true at the start of the 6R4 programme, developments saw a reduction of the lag and significant increases in the top end horse power, so the 6R4 was never truly competitive. However, that is not to say it wasn’t quick as the acceleration and traction even by current standards is staggering. The international specification cars would achieve a 0 to 60mph time of around 3.0 to 3.2 seconds and the G forces pinning you to the seat would, from the author’s experience, try and fold your face around the integral head rests of the seats. The gearing was obviously low to maximise the acceleration so that top speed would equate to maximum rpm and be achievable on the specific routes the car would be driving. Read that to be a maximum usually set at between 110 and 120 mph at around 9000rpm. Clearly the engine able to deliver this was something special, like the rest of the car. It was a special one off designed 2997cc V6, which was originally loosely based on the Rover V8. Indeed the first development engines used to power prototype cars was a Rover V8 with two cylinders lopped off. The finished engine was designated V64V standing for V6 for the configuration and 4V denoting four valves per cylinder. It was a completely new engine designed just to power the 6R4 and utilised normal advanced race engine technology of the period, which is commonplace in the 21st Century. However, even today a V6 with quad cams and four valves per cylinder producing around 410bhp with a rev limit of 9000rpm, will be regarded as very interesting. In 1985 it was a specification to drool over. To comply with homologation rules of the period cars had to be made in a production run of at least 200 cars, plus for an ‘Evolution’ model a further 20 cars must be made. Interestingly records show that only 205 were made in total. Most cars were built to what is know as the ‘Clubman’ specification which used less focussed specification with the main difference being the use of a single throttle injection system rather than a multiple throttle system, and a ‘cooking’ power output of 250bhp, still outstanding for the day when 150bhp was a rare sight. The top spec factory car was known as the ‘International’ spec with the obvious connection to it being built to International spec Group B rules. Initially the engines in this spec delivered ‘only’ 385 bhp, but as with most active competition development, that was to rise. Indeed after the banning of the Group B cars because of safety worries (the cars were simply too quick and delivering comparable acceleration to Formula 1 cars) the 6R4 was to see a continuing successful and active career in various arms of motorsport with further power developments and some smaller 2.5 litre versions of the V64V engine to help cap power which was similar in this capacity to the earlier 3 litre capacity engines, plus the shorter throw crank aided the rev capacity of the engine and reliability. The most powerful and in some aspects the most successful versions were seen in the hands of Will Gollop in international Rallycross where his turbocharged 700 plus bhp 6R4 scored many international victories and took him to several titles. The MG Metro is not seen as one of the favoured MG classics but there is no mistaking that the MG Metro 6R4 is one of the greatest rally cars of all time and as such makes it one of the greatest MGs too. Valve Gear: 2 overhead cams per bank. 4 valves per cylinder. Transmission: 5 speed dog engaged manual gearbox with permanent four wheel drive. Borg & Beck twin plate diaphragm clutch 7” dia. Viscous centre coupling. Prop shaft drive to front differential, quill shaft drive to rear. Fully articulating drive shafts. Suspension: Front; Independent, coil spring, strut and bottom wishbone. Bilstein telescopic gas filled dampers, anti-roll bar. Ride height, camber, toe-in and anti-roll are all adjustable. Rear: Independent, coil spring, strut bottom wishbone and trail link. Bilstein gas filled telescopic dampers, anti-roll bar. Ride height, camber, toe-in and anti-roll are all adjustable. Front: 12" dia ventilated discs. Rear: 12" dia ventilated dies. Four piston calipers all round. Handbrake: hydraulic lever acting on rear discs. Wheels: Dymag die-cast magnesium alloy with various Michelin tyres dependent on conditions. Performance: International spec: 0-60 mph 3.2 seconds. 0-110 mph 10.00 secs. Clubman spec: 0-60 mph 4.5 seconds. 0-100 mph 12.8 secs.